Rotary washing lines provide the drying space and convenience to get your family’s washing dry quickly and with minimum fuss. Rotating in the wind to ensure even drying, our favourite rotary lines are feature rich and make a compelling choice for anyone wanting to dry their clothes naturally. Rotary washing lines needn’t be a permanent feature of your garden; once your washing is dry, the washing line can be folded and stored, freeing up lawn space for more important things. The Rolls Royce of rotary washing lines, the Brabantia’s solid build and range of thoughtful features will turn an every-day chore into a quick and easy job. 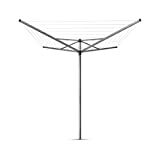 Brabantia have been making rotary dryers for over 20 years and as a result of the many iterations of this product, they developed a fantastic rotary washing line. 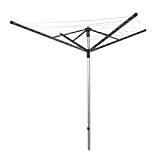 It’s little wonder that this is the best selling rotary washing line on Amazon.co.uk. With the Easy Lift system opening the 50m Lift-O-Matic Advanced Rotary dryer takes little effort. 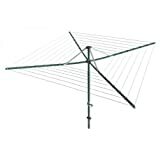 The rotary washing line can be adjusted from 129 to 187cm to suit your ideal working height. The dryer turns smoothly even when loaded with wet washing and has 50m of drying length, so it’s ideal for a family. 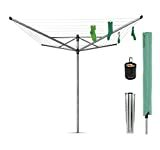 The washing line has four robust, weather-resistant coated arms, so you can leave the Lift-O-Matic outside all year long. It features a push button ratchet and individually strung lines making it easier to keep the lines taught. Lift-O-Matic rotary washing lines come as standard with a plastic ground tube and protective cover. All arms have an integrated hanging loop to enable you to hang clothes on hangers, and it’s guaranteed for 5 years. All in all, if you can afford to spend the extra, this rotary washing line is a wise investment. Ease of assembly. This rotary line can be a bit confusing to put up first time; you have to extend the pole to the required height and then adjust the upper lines of the dryer. Unfolding all rotary washing lines can require some additional effort when new, but this inconvenience will be resolved after a few times of unfolding and collapsing the line. Installing the ground spike requires some effort, we recommend digging a hole and using post cement rather than trying to hammer the spike into the ground. It is one of the more expensive rotary washing lines on the market, but the build quality reflects value for money. 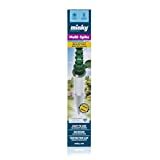 A sturdy and great value rotary washing line – with 4 rotating arms and a huge 55m of drying space, Minky’s flagship rotary line has the capacity and is strong enough to dry 5 heavy loads of washing. The dryer is equipped with individual lines that are strung through holes in the arms and auto tension as the arms are raised, which pulls them taught and practically eliminates the problem of sagging lines. The ability to lower an arm section of the washing line allows for easy loading and an innovative pulley system works well, helping raise the arms under a heavy load to the first locking point. An aluminium construction and extra strong galvanised steel arms make this rotary washing line weather resistant and lightweight. Plastics used in the construction of the airer, such as in the housing of the rotary arms could be higher quality. The included ground spike is made of plastic rather than metal. Australian company Hills has been making washing lines since 1946 and is known for its thoughtful, family oriented designs and high quality manufacturing. The Hills Rotary 7 is no exception. From the premium range, the Rotary 7 has a corrosion resistant steel centre pole and zinc galvanised moving parts to provide complete protection from the elements and years of service. Innovation in the design delivers some first-rate features including a hoist mechanism that allows you to hang the washing out in the lower position and wind up the lines using an ergonomic handle for maximum drying efficiency. The Hills Rotary 7 is the mid-sized washing line in the premium range and the 47m of line space will easily accommodate 2 to 3 full loads of washing including double sheets, making it ideal for a family of 4. If you’re after a robust and durable rotary dryer and have the budget to splash out, you’ll be very pleased with the Hills. At £209.99, the Hills is one of the more expensive rotary lines available, and it’s heavy, so you’ll need to install it properly using post cement.